The aero club had a meet-up the other night, the second I’ve managed to make it to, a good night all round and another reason why flying at a club is more than just a formal training exercise. I’m meeting more and more great people along the way. Today the objective was to do really slow flying (45-50knots) and lots and lots of stalls in various configurations. To get a feel of entry into a stall, the symptoms to watch out for and the correct way to recover should the stall develop. I’d be flying with an instructor I’ve flown with before, his day job is a commercial airline pilot so I enjoy flying with him as I feel I learn a lot. Primarily the briefing was focused on checking I understood why a plane (in particular its wings) stalls: The critical angle of attack of the wings has been exceeded. Various other factors on what will make a plane more likely to stall (such as banking the aircraft, having the flaps down…..) and the airspeed’s at which such things can be expected to begin to occur. However, when it comes to airspeed, read the above italic statement again. Stalling is not due to flying below a constant speed, but about exceeding the critical angle of attack of the wings for a given speed. As such the angle of attack at which the plane stalls is relative to the speed you’re flying and the airflow you’ve got going over/under the wings. Consequently you can stall at any speed. 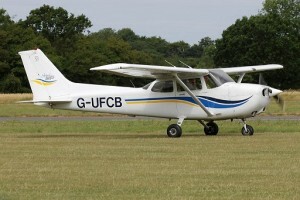 In a Cessna 172SP though, the general rule is that with flaps up, wings level, it will stall around the 45knot mark. A quick check I’d memorised my HASELL & HELL checks and we were on our way…. A conversation with the club administrator concluded there’d been some discussion in our absence and we’d be flying Charlie Bravo – I did ponder if my regular instructor was setting me up, because she knows Charlie Bravo does not like me much. Twenty gallons in the left tank, Eighteen in the right and nothing else exciting to report beyond the fact that I could almost believe its throttle and mixture plungers had been replaced with shiny new ones (but more likely someone had just cleaned them). The taxi to the holding point was very smooth and very centred, either I’m getting better or Charlie Bravo was having a good day…….didn’t get told off for riding the brakes so I was at least getting that right for once! In a strange way I think my night flight taxi improved my taxing, but it could just be a one off. As we set up to finish the power checks into wind at the holding point another Cessna requested permission to taxi, nothing unusual except this time I knew the pilots voice!! Very bizarre, we’d met at a previous club meeting night, she’d have been hearing my (thankfully good) taxi request, I could hear hers and she was about to hear if I stuffed up my request for take off clearance or not…….. It shouldn’t be strange, but not knowing the people who can hear your radio calls is one thing, knowing is something else. After getting our clearance to take-off from runway 23, I got it roughly lined up straight and then on with full power, 65 knots, pull back on the yoke and it was up, up and into massive amounts of wind! I mean properly all over the place wind, it was like flying a helicopter trying to keep the plane level and the airspeed at a constant 80 knots. It was never going to be my best work, but the instructor left me to it so it can’t have been to far wrong. The gusting wind continued up to 2,000-2,500ft. After which we were above the worst of it and things became very nicely settled. Tower Air Traffic Control call us to contact approach, this is all normal except this time my instructor looks at me and says “Do you want to do it….” In the spontaneousness of it all I bailed on the idea and let him handle the reply (I was busy flying a plane and nobody said anything about being able to do that radio call today 🙂 ……but I’m pleased it happened because it’s another step forward on the radio work). I did a climbing turn to the west and kept us going up before leveling out around 3,500ft. Backed the power right out and let the plane hold straight and level at around 55knots, this was a chance to play with the controls and get a feel for how much more sluggish everything becomes. The other thing that strikes you on slow flight is the quietness, the engine is working so much less that it’s actually quite a peaceful background sound. 45-48Knots the stall warner horn begins to go off for the first time. 40-43knots, it stalls……..the left wing dips, the nose drops. Resisting the temptation to correct the wing drop (using ailerons at this stage risks making the stall worse), I push forward on the control column let the speed come up to 72 and then correct the wings and climb out of the stall. As simple as that, other then spending 3-4 seconds pointing at the ground, nothing much to it. I didn’t look at our descent rate during the stall, due to being a bit busy recovering it, but I’d guess if I’d done nothing we could have pointed at the ground for 2.5-3 minutes before hitting it. After recovery I was told it was a nice recovery, I’d not fallen to the temptation of applying aileron before unstalling the wings. We did a few more stalls, and then started to use power to recover the stalls. During the latter, I was told that while I was handling the plane nicely I was perhaps pointing at the ground for a bit longer then I needed to…….we did a few more to work on that. 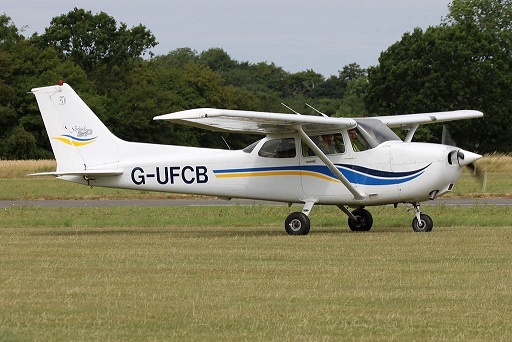 If stalling a Cessna 172SP with wings level felt like hard work, stalling it with flaps was like trying to stab yourself in the hand with a needle – you can do it, but to actually go through with it requires quite a lot of mental intent. A quick 90 degree turn (at 30 degrees of bank) left, followed by a 90 right to check the area is good and a re-run of the HELL check, we’re good to go, very few planes are up today it seems. Flaps down, wings level, all the power off…..lifting the nose, lifting the nose some more, still lifting the nose – unless you were to put on a ton of trim at this point the plane is so heavy you should know you’re doing something daft. Still lifting the nose…..finally at around 35-40knots the stall warner goes, but the wings have not stalled, so still lifting the nose and wham the left wing drops like a brick, the nose follows it. Some rudder, push the nose forward to unstall the wings, power on, as the wings unstall I climb away. It’s not the fastest recovery and my instructor suggests that I’m still pointing the plane at the ground a bit longer then necessary. I suspect this has something to do with visually not feeling threatened, I can see we’re pointing towards the ground, but I can also see I’m 3300ft up and have plenty of time – so instinctively I’m flowing out of the stall, rather then panicking out of it like you might do if you did this at three hundred feet. We try a few more to try and get me to recover a touch faster, but that makes me start putting aileron on first – so now I’m swapping error for another. We head out west again and do a load more stall and slow flight work, before finally my instructor takes the controls and demonstrates a Spiral Dive. It’s about as ‘aerobatic’ as a Cessna can get (and as close to a Spin as you’re allowed to do), something for my next lesson. Out of time I’m handed back the controls and we head for base. With ATC permission we ‘sneak’ into the downwind leg of the circuit, I descended pretty fast to get us down to circuit flying height of 1000ft, just in time. I make the turn on to the base leg, followed almost immediately by a turn on to final. All the power off, flaps down, we’re descending from 1000ft at 70knots. It’s insanely windy, my instructor has already told me he’ll do the landing, but for now I’m still flying the plane, 500ft, it’s all still nicely lined up the wind is insane at this altitude, but with a fair bit of right rudder on, we’re heading right for the runway numbers. 300ft, a touch low, a bit more power on to correct that and it’s back to looking fairly good…… at 150ft my instructor takes control, at this stage there was nothing wrong with the approach and I truly believe I could have landed the plane on that run. After taxing back to parking and shutting Charlie Bravo down, my instructor says my approach was very good. He says I’ve got good grasp on slow flight, stalling and recovering and should be able to finish it all off in the next lesson without any problems. The note on why recovering promptly is important is reiterated which is a fair comment. All in all though, a very enjoyable lesson and given the wind, very pleased to have been able to get this done – the opportunities to get to 3,500ft to do this kind of exercise as winter approaches are going to get more and more limited. This entry was posted on Saturday, November 26th, 2011 at 3:52 pm by PHC	and is filed under Actual Lessons. You can follow any responses to this entry through the RSS 2.0 feed. You can leave a response, or trackback from your own site. Great job enjoyed last two lessons. Flying in the dark must f been scary stuff! Are you doing your night qualification to? Flying in the dark was really good, without the reassuring GPS and a very experienced instructor in the right hand seat I might have felt differently though. I’d recommend it to anyone though, especially once they’d started on their PPL, at least as a one off experience. Yes my ultimate plan is to get my PPL and then my night rating……..who knows from there possibly even my IMC (or whatever EASA end up calling the new version of it). Was suppose to be flying again today, but it got cancelled due to the high winds (gusting beyond 30kts). Great to see you’re still following this and appologies for not having got back to your last email yet. Cool sounds great fun. Yeah looking to do similar ppl then night and see how go from there! No worries guessed you been busy. How’s your ground school going? ?